Deep Patch™ is solid concrete repair product for patching large holes in concrete surfaces. SureCrete’s solid cement filler is a single component, just add water cement based chemical patching compound system providing a patch that goes from 1/8″ (0.32 cm) and up. Deep Level, previous name, offers superior power to patch larger spalls in concrete floors, build ramps, repair loading docks, and parking lot pavement. SKU: N/A Category: Concrete Surface Preparation Products Tags: Large Cement Hole Repair, Large Concrete Hole Repair, Thick Concrete Patch, Thick Concrete Repair Brand: SureCrete Barcode: 842467102206. 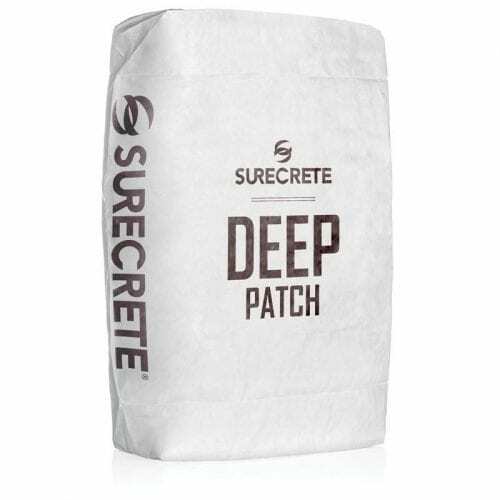 Deep Patch™ is a just add water concrete patch for large concrete voids or holes. Performing well in filling low spots on horizontal surfaces and filling open areas (e.g. planters). The silicate aggregate size will cut the usual shrink cracks associated with topping mixes used for concrete repairs. 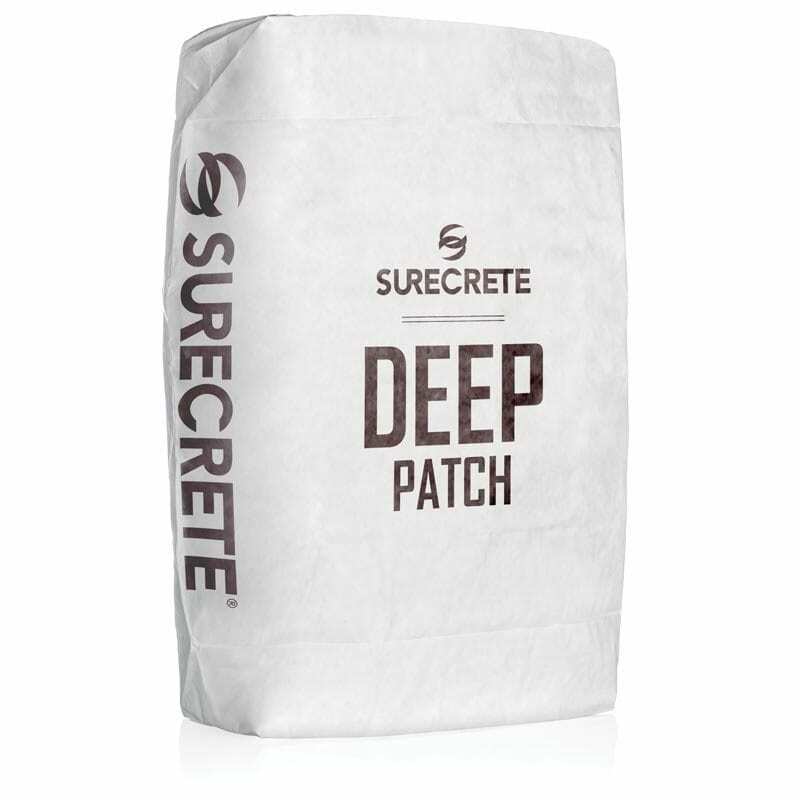 Contractors and DIY homeowners alike will want to take advantage of the benefits of Deep Patch™ for their many concrete patching projects. It can give a suitable alternative to destroying old, damaged concrete and having to repair a new slab entirely. 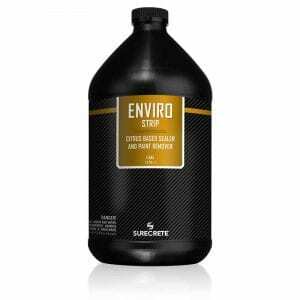 This product will allow the applicator just to remove the concrete areas that are too damaged to repair and fill in those voids instead of replacing the entire substrate. Contractors will speed up a restoration process, as instead of having to wait 28 days for a freshly poured concrete to cure, most of all, customers can start applying a finished flooring product on top of Deep Patch™ the very next day. 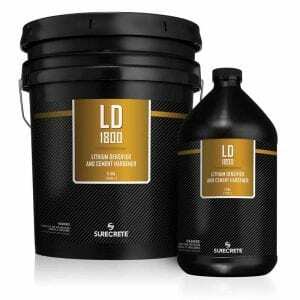 How to Apply SureCrete Deep Patch™ Concrete Hole Patching Leveling Material? Clean the surface – Concrete substrate should be completely clear of any grease, oil, old paint, etc.. Otherwise it will not form a good bond. 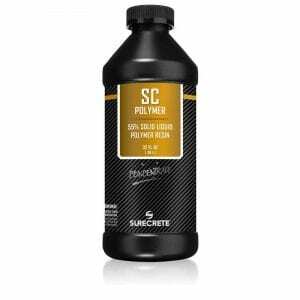 While not always necessary, some areas may need profiling if they are exceptional “tightly trowelled.” Easily be done with another of our Surface Preparation products – SCR. Dampen the surface of the concrete (no puddles, though!). Then apply a thin coating of SureBond (associated product used as a bonding agent, mixed with water, sold separately) to a small work area so as not to let it dry out. Mix Deep Patch™ with water thoroughly in a large bucket. While working to ensure it does not set up before it can be applied. Apply Deep Level to ONLY the work area where SureBond is present, not dry. Continue following these steps until all sectors have been patched/covered to your satisfaction! Deep Level is typically trowelled into place; however, application methods will vary depending on the project needs. Patches in excess of 2” (5 cm) up to 4” (10cm) require the introduction of # 8 pea gravel (3/8 – ½” [9.5 – 12.7 mm]) at the rate of 10 pounds (4.5 kg) pea gravel to 1 – 50 pound (22.7 kg) bag of Deep Patch™. 1. Before applying Deep Patch™, the surface should be saturated surface dry with clean water (SSD or damp, no puddles). 1. While SureBond™ is still wet, use Deep Level™. 2. Apply Deep Patch™ by trowel or squeegee, ensure the product is tightly placed into patched area. Question: How thick can I go with Deep Level Large Concrete Hole Repair? Question: What’s the thinnest I can go with Deep Level Concrete Hole Repair? Can I give it a feather edge? This product was not designed to be able to give a tight, feathered edge, or a finished surface. The aggregate size is quite large; the thinnest is can be applied 1/8″. If a smoothing feathered repair concrete finished edge is desired, try using one of our other products such as FlashPatch™ or SureTex™ with Deep Level. Question: How long do I have to wait before applying an overlay on top of Deep Level Concrete Thick Repair? While an overnight cure of 12 hours, enough for most coatings systems, depending on the thickness that Deep Level was applied, we suggest waiting a concrete setting full 24 hours before putting any overlay or surface on top of a new Deep Level application. Question: Can Concrete Deep Hole Filler and Repair Cracked be Colored? Yes. However our coloring systems matching color charts have formulated based on white-cement-based products, so we cannot offer a typical color chart picking and choose the finished color from, they will almost seem different in Deep Patch™ since it is a grey-cement-based mix. This product was not designed to be able to provide a tight, feathered edge, or to be a finished surface for that matter. The aggregate size is quite large, and the thinnest is can be applied is 1/8″. If you want a feathered, finished edge, try using one of our other products such as Flash Patch or SureTex in conjunction with Deep Level. While an overnight cure of 12 hours may be enough for most coatings systems, depending on the thickness that Deep Level was applied, we suggest waiting a full 24 hours before putting any type of overlay or surface on top of a fresh Deep Level application. Question: Can Deep Level Concrete Deep Hole Filler be colored? Technically, yes. However our coloring systems and matching color charts have been formulated based on white-cement-based products, so we cannot provide a typical color chart for you to pick and choose the finished color from, they will appear different in Deep Level since it is a grey-cement-based mix.